Densely branched, dwarf hedge to 3 feet tall, topped by large 7" sunflowers. Very distinctive flower form, with double rows of bright yellow ray petals surrounding the dark center disc. Perfect addition for sunny borders and for fresh bouquets. For all summer-long supply of cut sunflowers, repeat sowings in containers or directly in garden beds. Sunflower, Sunny Bunch is rated 3.4 out of 5 by 5. Rated 5 out of 5 by platespinner from Excellent Review for an Excellent Sunflower! I've been surprised that this little sunflower has received any negative reviews at all. This will be my third summer to grow Sunny Bunch. The first year, they were so beautiful that a girl we didn't even know walked up the hill to our garden and asked if she could have some for her wedding bouquet. Obviously, we were honored to say yes! In the attached picture, Sunny Bunch is the front row of my sunflower garden. Makes me happy just to look at this picture! Rated 5 out of 5 by realfarmgirl from Beautiful! 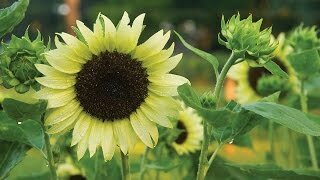 Sunny Bunch is a PERFECT traditional sunflower, but in a shorter plant. I was so pleased when the first bloom opened, bright yellow perfect flowers. I am so happy that I bought it, would strongly recommend to anybody who wants a short sunflower. Rated 1 out of 5 by Lexi from Never grew! They never grow! Very disappointed with entire order. Rated 1 out of 5 by Tandy from Very disappointed I planned a sunflower garden of various colors and heights around my property. I got about 20 straggly sunflowers. Rated 5 out of 5 by DandM from Excellent borders This was my first time growing this sunflower. I really wanted a flower that I could use to cover the wall in the front of my property and I wanted something that would bloom all summer long. I started them early indoors with no trouble. All the plants germinated. The height matched perfectly with the height on the packaging. I really love how this particular sunflower had multiple blooms on it that opened at different time which lasted all summer long. My children really like watching the birds eating all the seeds after the blooms where done. The plants grew so well several neighbors ask what kind of flower it is and where I got it from. I will definitely plant again next year.